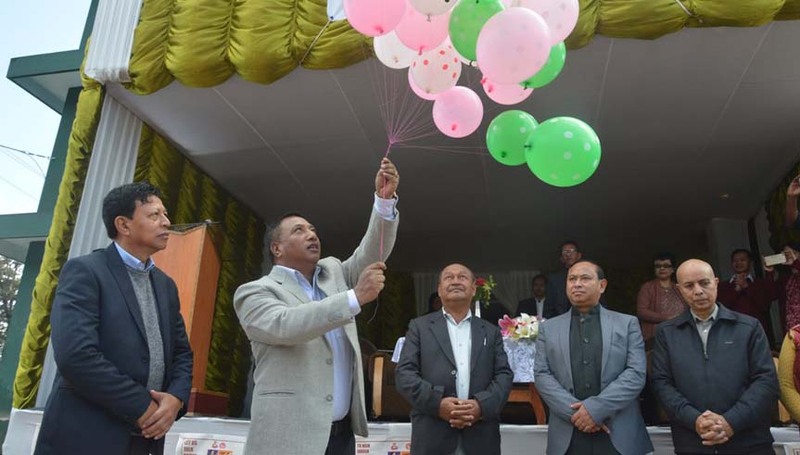 Meghalaya Minister for Health and Family Welfare AL Hek on Tuesday released a bunch of colourful balloons to mark the launch of the Leprosy Case Detection Campaign for East Khasi Hills and Ri Bhoi districts at the premises of Civil Hospital, Shillong. The programme was organised by the the National Leprosy Eradication Programme, Meghalaya. The Leprosy Case Detection campaign is a unique initiative under the National Leprosy Eradication Programme (NLEP). affected can be saved from physical disability and deformity by providing timely treatment and thus halting the transmission of the disease at the community level. Speaking on the occasion, AL Hek called all the present to be ambassadors of the campaign so that the objectives of the campaign are achieved. Stating that the period of two weeks is too short for health workers to reach out to each and everyone, Hek stressed on the need for cooperation from the society, at all levels, so that leprosy can be eradicated from the State. Delivering the keynote address, Dr. M. Marbaniang, State Leprosy Officer, informed that the State of Meghalaya has an average of 20 to 30 cases annually which includes new cases and cases under treatment. Amongst these, cases with grade 11 disabilities have been detected which indicates that cases are being detected late or there are untreated cases which lie undetected. Prizes were also distributed to the winners of the essay completion held for the Class 9 students of Holy Child Secondary School. Meghalaya Minister for Health & Family Welfare, Shri. A. L Hek, released a bunch of colourful balloons to mark the launch of the Leprosy Case Detection Campaign for East Khasi Hills & Ri Bhoi District today at the premises of Civil Hospital, Shillong.